Like many in the United States I am enjoying the four day Thanksgiving weekend. But I did take some time to look thorough some blogs to see what others are saying. Over at the CNN blog I found a post in which Rachel Held Evans responds to some statements made by Mike Huckabee on Jon Stewart's The Daily show. Huckabee was talking about 'biblical values" and Stewart really challenged him on it. In many ways I don't think Stewart gave Huckabee a fair shake, even though I disagree with Huckabee. I think there are better and far more important questions that we can ask about what it means to be "biblical." Tomorrow is Thanksgiving. It is a day in which we are supposed to join with family, friends and neighbors to give thanks. It is a day that, at least in theory, we should take time to thank God for all that we have in life and that we have lived to see another Thanksgiving. It will also be a day for feasting, football and parades. But for some it will be time of plotting their course through the local department stores as they prepare to hit the Black Friday sales, some of which now begin on Thanksgiving day. Over the last 20 years the whole Black Friday phenomenon has developed from the official beginning of the Christmas season to a day in which people line up at insane hours in front of a mall and then punch, bite, claw, and in some cases, kill others to get that must have item. The "thankfulness" they showed the day before evaporates as the more base instinct for material goods kicks in. 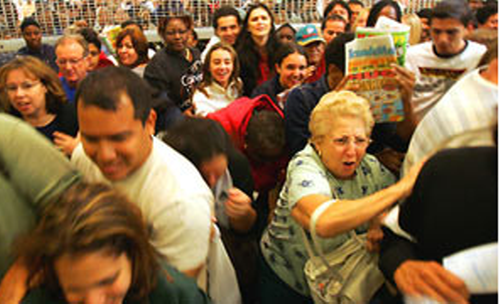 I avoid the stores if at all possible on Black Friday. I would rather not participate. I really find it a sad display of human character gone all wrong. And if we think about it, there are theological and moral implications related to the way we act on that day. My friend and colleague Allan Bevere has a thought provoking post on the topic today. I think he really hits the nail on the head. Here is a bit of what he says, but please do go read his entire post and let him know you stopped by. Black Friday and the entire Christmas shopping season is one more instance that reminds us of the deep problem in American culture in which we are unable to separate our wants from our needs. The reason for such inability results from the loss of life centered on the divine. When that center is lost we rush to meet our needs with every imaginable want, and we seek to make others happy by giving them what they want.